Develop children's ability to perceive differentiate weights. Build concentration, matching and focusing skills. 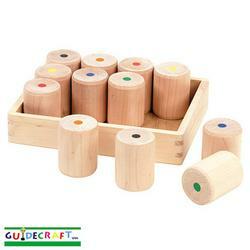 Smooth wooden cylinders invite children to pick them up and weigh them with their hands to discover a match. Turn cylinders over to compare color-coded dots on the bottoms for self-correction. Method of shipping is UPS Standard. Material: Hardwood.